In our little town in central NH, we have a town common. One of the best ways to let everybody know what’s happening in town is to put up something on the sandwich signs that the town lets you use. We do this with a vinyl banner, which people simply staple to the wooden sign. 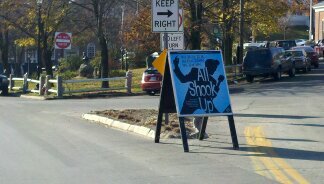 In this case, they are advertising the upcoming production of our award winning high school drama department. The typical sandwich sign that you put out in front of a store is really too small for this application. We make these vinyl banners 30×36″ in size. Any smaller and they would be hard to read as you drive by. If the sign was any larger, it would block views of the cars coming around the common. This type of sandwich sign works great at almost any high traffic location where people are going slow! This entry was posted in Vinyl Banners and tagged event sign, outdoor banners, sandwich sign. Bookmark the permalink.